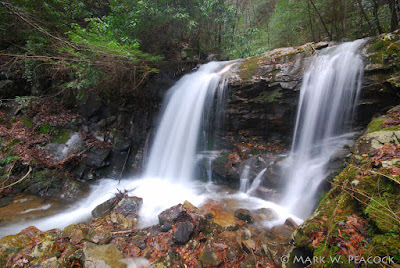 Pine Ridge Falls is a 25 foot waterfall found in the beautiful Clark's Creek area of Unicoi County, TN. I can't believe I've lived here for so long and I'm just now discovering such amazing places. It's in very close proximity to another recent "find," Sill Branch Falls. Both are short hikes and could easily be done on the same trip. For a much longer, and much more difficult hike, check out Buckeye Falls. But the hike to Pine Ridge is short, I'd guess a 1/2 mile. It's an easy walk, except for one creek crossing that can be tricky when the water's up. If you go in the summer months, I'd recommend wearing jeans -- there's lots of poison ivy at the beginning of the trail. If you only have time to hike to one of the falls and were deciding between Sill Branch and Pine Ridge, I'd recommend Sill Branch. Pine Ridge is nice, but lacks the wow factor of the taller and much more elegant Sill Branch Falls. This scenic area is centrally located to Greeneville, Jonesborough, Johnson City, and Erwin on Clark's Creek Road, off of Route 107. If you've lived in this area all your life and never been down Clark's Creek, put it on your list of things to do. Even if you're not much of a hiker, Clark's Creek is a beautiful forest drive, especially this time of year when you can see through the woods to the creek below. The road through Clark's Creek is gravel, and while it has some pot holes, it's in pretty good shape -- and while it's narrow, it's not steep. It's one of the few forest service roads in the area that I can confidently say a high clearance vehicle isn't absolutely necessary (although you'd handle the pot holes with a lot more confidence!). At the end of the road is a wide cul-de-sac which makes for an easy turn around. Just take your time and watch for horseback riders who frequent the area. Directions: Take I-26 to the Erwin/Jonesborough exit #37. At the end of the ramp, turn right and take State Route 81/107 west for 6.5 miles, stay on Rt. 107 by turning left and continue for 5 more miles. 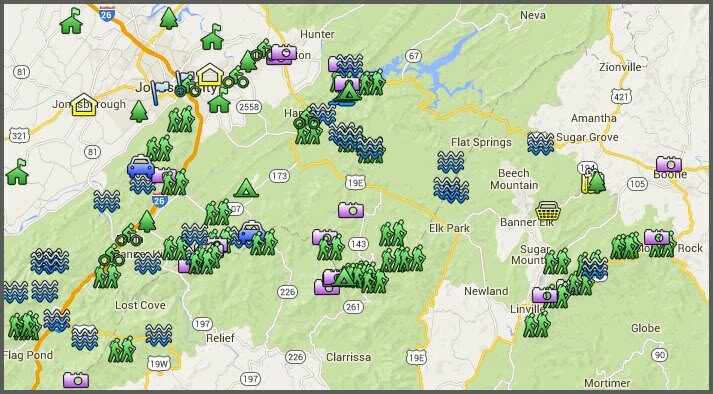 Turn left on Clark's Creek Road and drive 3.3 miles (the last 1.9 will be gravel) into the Cherokee National Forest to a parking area on the left (It's 0.2 miles past the parking area for Sill Branch Falls). A small brown sign will indicate the trailhead for "Longarm Branch Trail". After a short hike, you'll reach the creek crossing; once across, the trail will fork -- stick to the left, the falls are just a short distance further. We are planning to hike with llamas to these two falls. We drove up the Forest Road. Which one is the first turn around and which one is at the large cul-de-sac at the end?